Why Choose Invisalign in Jacksonville? Your smile is important to your appearance and sense of confidence. You want to smile, laugh and speak in public, but gaps and crookedness make you feel ashamed. Metal braces seem like a terrible treatment option because of their appearance, and they can be very time-consuming. However, you do have a great alternative in Jacksonville: clear braces from Invisalign. They’re clear, comfortable, and removable, and best of all they craft healthy, beautiful smiles. Experienced dentist in Jacksonville, Dr. Larry Young, recommends Invisalign to older teens and adults who have mild to moderate tooth alignment problems such as gaps, crowding, overjet, tooth rotation, tooth tipping, overbite and underbite. The appliances resemble teeth whitening trays and are customized to fit precisely over top and bottom teeth. Over the course of nine to 18 months, with a year being average, the aligners steadily move teeth into healthier and more attractive positions. 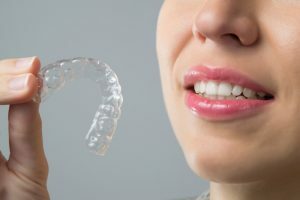 Dr. Young believes Invisalign clear acrylic aligners are ideal for individuals who desire a proper bite and attractive smile aesthetics but wish to avoid the inconvenience and apparent look of traditional orthodontics. He uses oral exam, digital x-rays and three-dimensional imaging to determine candidacy for Invisalign. Once decided, a treatment plan goes to the Invisalign lab where a technician fabricates 18 to 30 pairs of BPA-free aligners. Dr. Young may even preview the finished smile for the Invisalign patient. In fact, Invisalign patients simply check in with the dentist every four to six weeks. They receive their next pairs of aligners, wearing each one approximately two weeks, 20 to 22 hours a day, before changing to the next set in the treatment plan. As with traditional orthodontics, Dr. Young and his team advise that Invisalign patients wear retainers after treatment has ended. A retainer keeps the newly straightened smile well-aligned for the long term. Invisalign makes a custom retainer called Vivera, and it is usually the appliance Dr. Young recommends. Over the years, thousands of people across the country have chosen orthodontic treatment with Invisalign. Should you be one of the next patients? Find out if you qualify. Please contact Larry Young Dental for an orthodontic consultation. You can stop covering your mouth and enjoy all the benefits of a beautiful set of teeth. Comments Off on Why Choose Invisalign in Jacksonville?